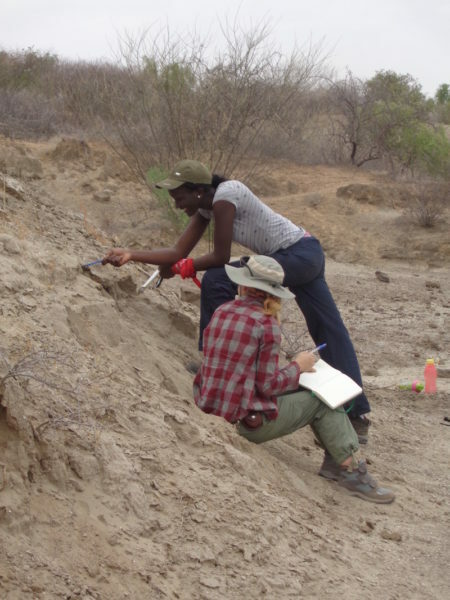 For this module, titled Sedimentary Geology and Geochronology of the Turkana Basin, Professor R. Linda Martin will be leading the students back in time as we reconstruct the past landscapes of the Turkana Basin. 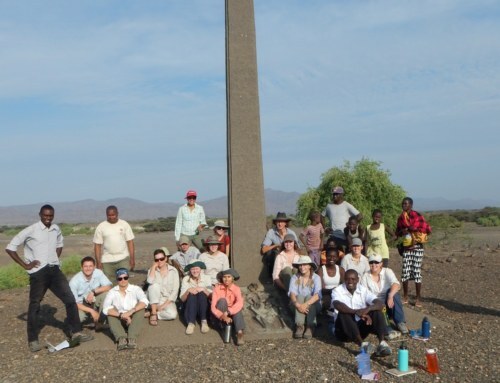 Professor Martin is currently the Academic Director for the Origins Field School and has been conducting research in the Turkana Basin since 2011. 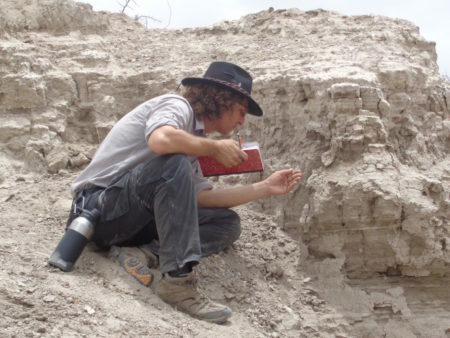 She is mainly interested in reconstructing past landscapes on which our ancestors evolved and specializes in sedimentology and stratigraphy. 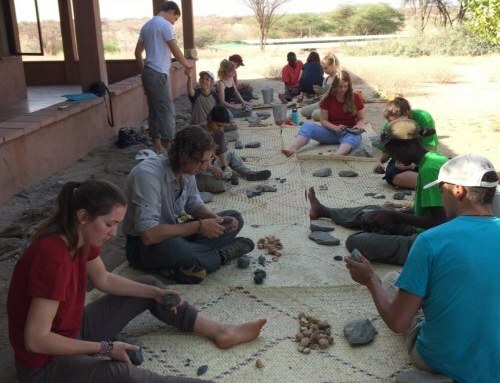 Professor Martin introducing the students to a rock bed near the TBI Ileret facility. To make the module even more exciting, two visiting professors from Stony Brook University, Dr. Dan Davis and Dr. Greg Henkes, will be sharing their knowledge with us throughout the course of this module as they explore the region themselves. Dr. Greg Henkes, left, and Dr. Dan Davis, right. 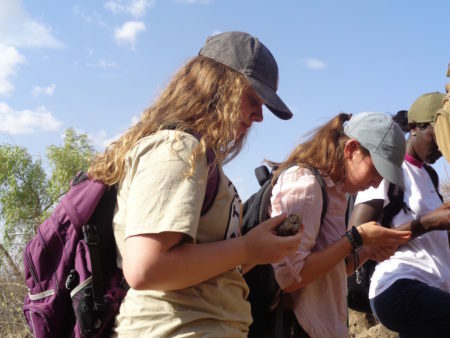 In this course, students will be learning how sedimentology and stratigraphy can be used to interpret the changing landscapes and depositional environments that are recorded in the Turkana Basin. 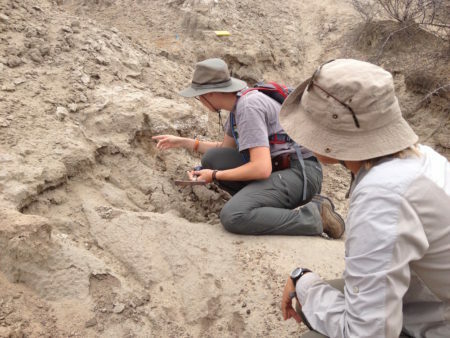 Briefly, sedimentology is the study of sediments, such as sand, mud, and clay, and the processes that govern their formation, transportation, deposition. These sediments can be observed as loose grains (imagine the sand on a beach) or as a lithified rock such as sandstone or mudstone. 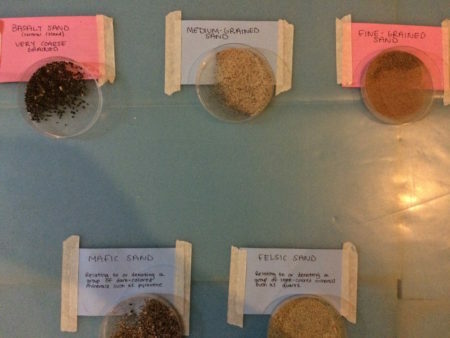 In the lab, different sediment sizes were organized accordingly to facilitate hands-on learning! Emily and Esther learn to distinguish between different sediment types. Stratigraphy is the study of rock layers, or strata, and how they came to be in the order that we observe them. In an ideal situation, the oldest rock layer will be at the base of the exposure whereas the youngest layer (most recently deposited) will be at the top. 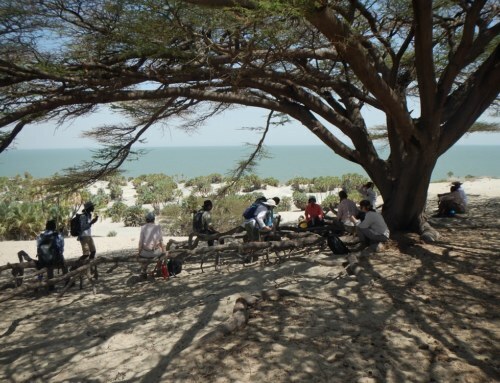 Lake Turkana, as we know it today, has only been around for the last 200,000 years. 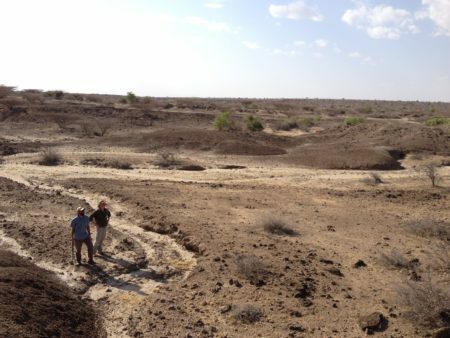 In the geologic past, the Turkana Basin was dominated by two different hydrographic features and sedimentary deposits: a large lake or a river and floodplain setting. Each environment has different energy levels and processes which means they deposit and distribute different “packages” of sedimentary deposits. 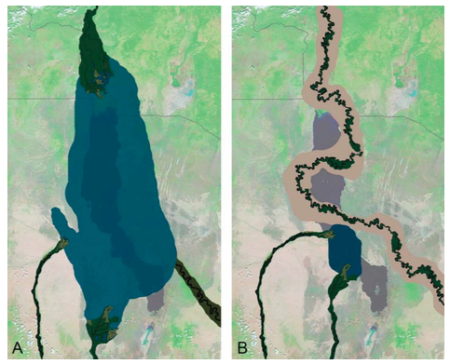 The diagram below shows one period of the Turkana Basin history where a lacustrine phase of deposition occupied the basin approximately 4.1 million years ago (Ma) and changed by 3.97 Ma to a fluvial (river & floodplain) depositional environment. 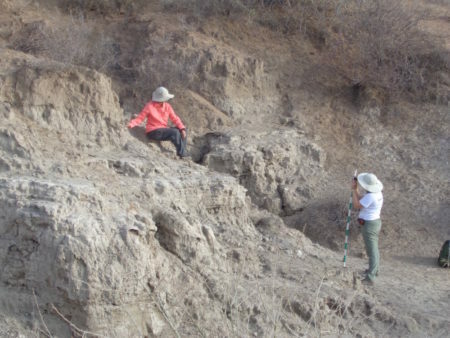 These shifts in depositional environments were due to factors such as tectonics and faulting, volcanic activity, climate variations, and changes in the amount of sediment accumulating in the basin. 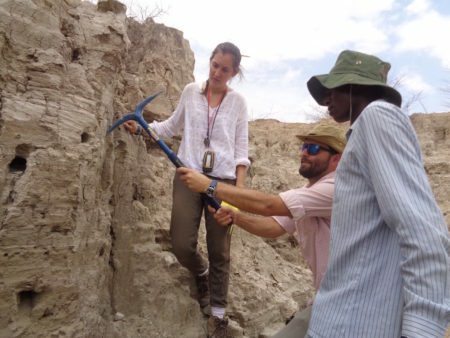 This combination of factors makes the Turkana Basin an idea location for the preservation of fossils and later exposure of once buried deposits via faulting. We stumbled upon a glaring example of how this area transitions between environments during one of our geology walks. 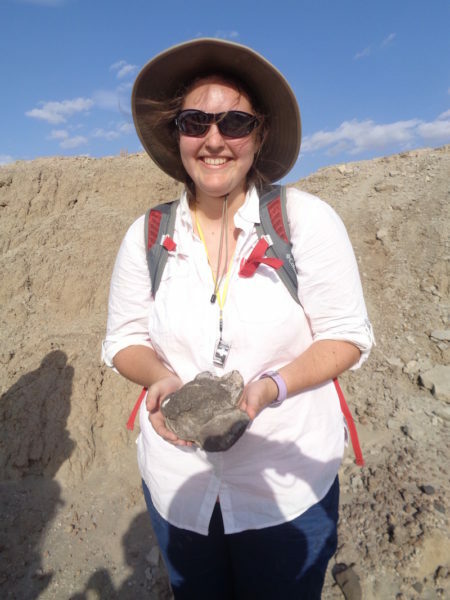 While analyzing the sediment structures of an exposure, Morgan found the head of a femur that belonged to an early hippopotamus species! 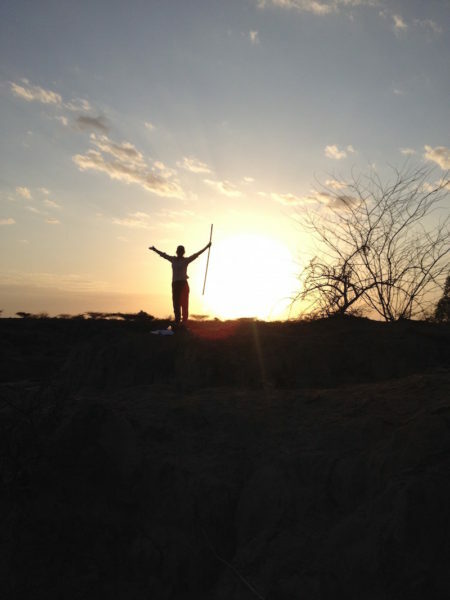 The bone fragment was found atop a hill many kilometers from the current lake level, the Omo river, or any other major water source. How could this hippo relative have survived so far from water? Morgan holding a fossilized hippo bone! 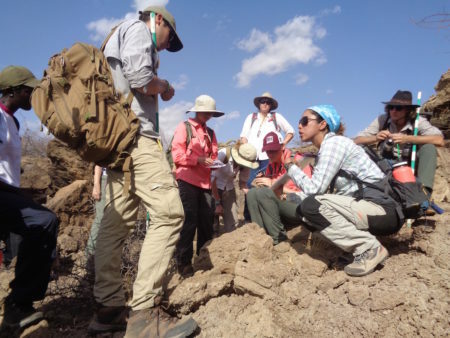 By interpreting the depositional setting of the surrounding exposures and finding other fossils of aquatic organisms, the students were able to imagine a suitable ecosystem for this ancestral hippo: at some point over the past several million years, this area would have been submerged, vastly different from the desert environment we found the fossil in. 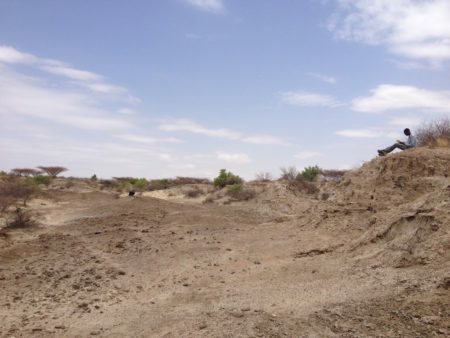 Being able to reconstruct past environments in the Turkana Basin is even more important due to the abundance of hominid fossils in this area. 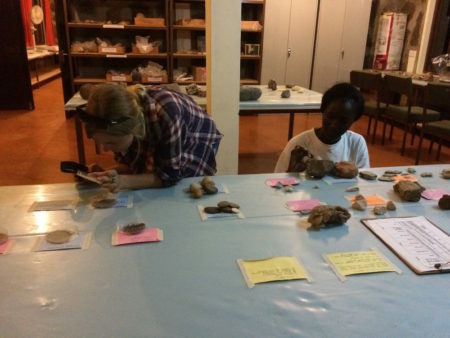 Our goal in the TBI Origins Field School is to not only understand the fossils that we find, but also to try to interpret why these developments are occurring: how might our ancestors adapt to their local environment, and did the environment create selective pressures that influenced the evolutionary path of our ancestors? But before you can recreate past landscapes, you must first understand what it is you’re looking at! 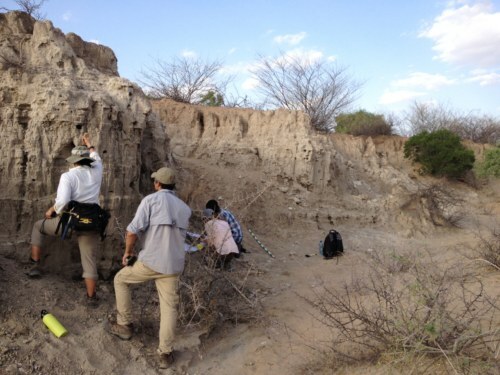 So, in our first field exercise in geology, Professor Martin brought us out to some nearby exposures to learn how to examine and document the sedimentology and stratigraphy. The first step is to fully investigate the area you are working in. Students walked around to examine the extent of the exposed strata they would document and created a sketch map of their study area. Professor Martin recommended finding a high vantage point to better understand the area in which you are working. Tobias picturesquely complied! After you have an overview of the area, then you can pick where to start! 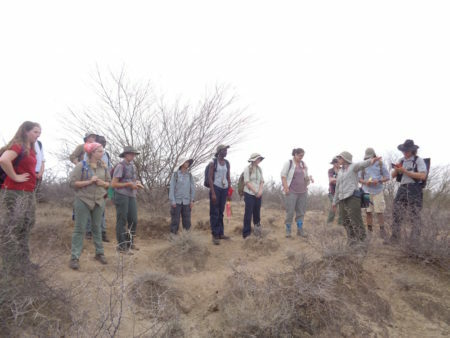 With a partner, students split up into different areas of the exposed deposits. 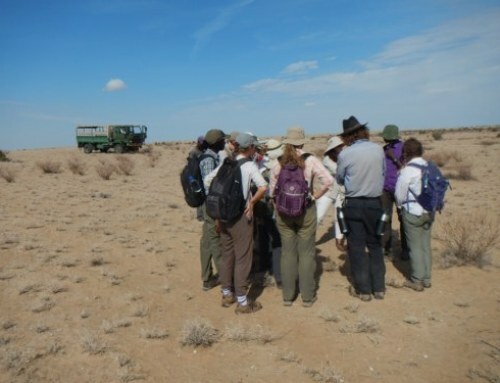 Here, they had to get up close with the sediments, documenting the different colors, grain sizes, sand composition, and sedimentary structures such as ripple cross-lamination that form from ripple bedforms and indicate current direction. Yvette, Millie, and Esther analyzing different grain sizes. Jon takes a closer look at the sediments in this deposit. Max tastes a little sediment to determine if its a silt or clay! 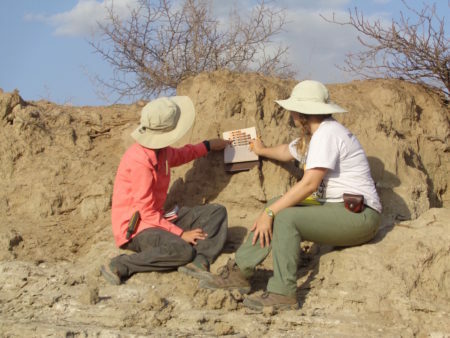 Kathryn and Carla use the Munsell color chart when documenting sediment colors. In their next step, each pair of students use the data they collected to create a diagram depicting the sedimentary patterns of the exposed strata called a stratigraphic section. This time the thickness of each unique bed is measured and the contacts between them are noted. One layer may consist of laminated siltstone that is eroded at the top and overlain by ripple laminated sand. 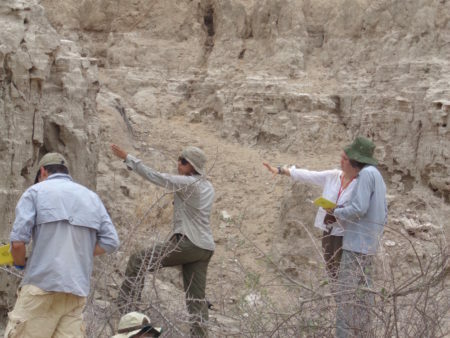 Combined, the sedimentology and stratigraphy allow us to interpret the depositional environment of the past. A few examples are grain sizes of sediment that reveal changes in energy, gravel and sand composition points to source rock and drainage patterns, and features in a mudstone that formed in a floodplain differ from those formed in a lake. Dr. Henkes clears off a surface so Millie and Tobias can get a more accurate reading! Carla and Kathryn work together to measure the size of the layers. TA Jayde helps clear off the surface of a section for Max and Natalie. Danielle points out an abrupt change in the sedimentology. Millie celebrates after a few day’s hard work pays off with a completed stratigraphic section! 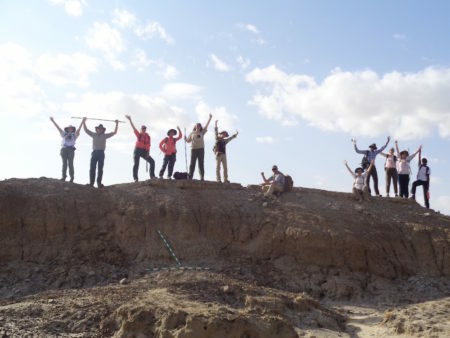 Creating a stratigraphic section is the first step in the long process of understanding and reconstructing the past landscape of exposed deposits. In the next lesson, students will be learning how to create a geological map. A geological map shows the different exposed rocks in an area which is critical for understanding how the sediments were deposited. This allows for many interpretations, most importantly what the past environment was like! 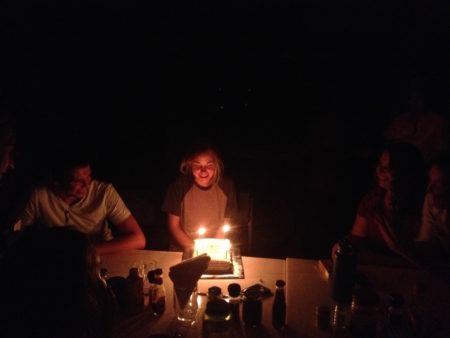 Aside from studying past environments, during the first week of geology we celebrated Emily’s birthday! The staff were so kind and thoughtful to bake her an amazing cake that we all got to enjoy! Hi I'm Mattia. 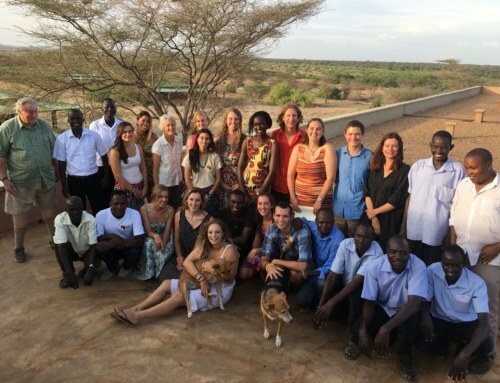 I am the teaching assistant for the TBI Field School Fall 2016. 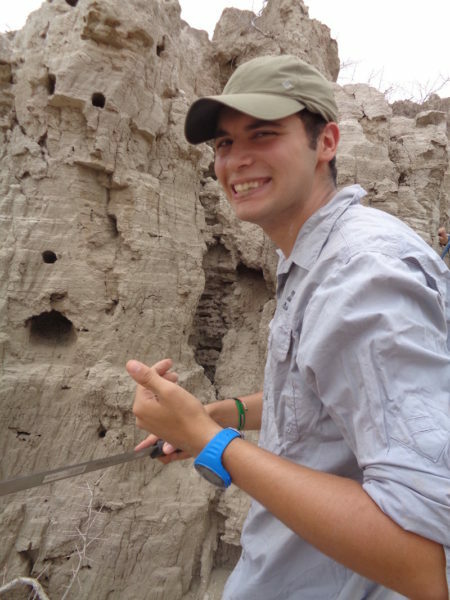 I recently graduated from American University in December 2015 and am an alumni of the field school. I am thrilled to be returning to this wonderful program and excited to share this life-changing experience with this year's students.